7 November 2008, at 10:30a.m. BELGIUM - Petersime will launch Eco-DriveTM at EuroTier next week. Eco-Drive is Petersime's latest innovation assuring that the energy consumption of the pulsator motors is reduced by 50% without having any influence on the quality of the chicks. Eco-Drive is standard on all new AirStreamerTM setters and hatchers and can be retrofitted to existing AirStreamers. Both at the beginning and during the end phase of the incubation process, a high number of revs are needed to make optimal use of the respective heating and cooling. 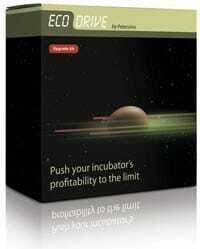 Because that need reduces considerably during the less critical stages of the incubation process (e.g. after cell division stage in the setter and before pipping in the hatcher), the power consumption and thus the electricity consumption of the pulsator motor is reduced to a minimum via Petersime's Eco-Drive, which leads to a substantial energy saving. when running at a low number of revs. Or in other words: if Eco-Drive allows the motor e.g. to run 20% slower, then the consumption is reduced by 50%. As a result, Eco-Drive turns the AirStreamer into the machine with the lowest energy consumption per egg in the industry. In addition, the frequency drive on the pulsator motor that is used for Eco-Drive allows for the motor to start up slower. This does not only avoid very expensive energy peaks but also substantially prolongs the durability of a number of mechanical parts.